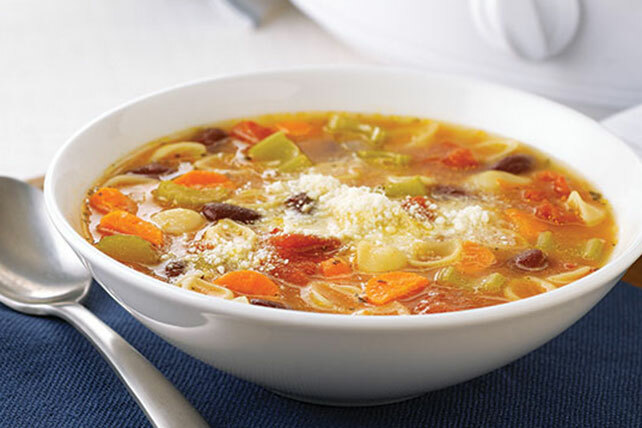 Enjoy veggies and warm pasta in this slow-cooker Minestrone Soup! Prepare this vegetarian version of an Italian classic for a dish everyone will love! Heat dressing in large nonstick skillet on medium-high heat. Add onions, celery and carrots; cook 2 min. or until crisp-tender, stirring occasionally. Pour into slow cooker. Add beans, tomatoes, broth, water and seasoning; stir. Cover with lid. Cook on LOW 6 hours (or on HIGH 3 hours). Stir in macaroni; cook 10 to 15 min. or until macaroni is tender. Top with cheese just before serving. Serve with crusty bread and a mixed green salad tossed with your favorite KRAFT Dressing. Prepare using canned white beans or chickpeas (garbanzo beans). Prepare using fat-free reduced-sodium beef or chicken broth.